Radhanath Swami had a deadline for completing the editing of the book, but the deadline had come right in the middle of one of the biggest festivals of the year. He had to give discourses that thousands had come from all over India to hear, and he also had to attend to guests who had come from different parts of the world. An ever-courteous host, Radhanath Swami was hard-pressed for time and so had no time to put into words the several ideas he had come up with to improve the book further. Consequently, our roles changed; he asked me to write several things and then he would edit them. On the last day of our editing marathon, he told me, “This is a book about bhakti and Hanuman is well-known the world over as a quintessential bhakta. So we should write something about Hanuman in the book.” (Hanuman is the heroic monkey-warrior in the devotional epic Ramayana) After a brief, animated discussion, we finalized what I should write. Suddenly, he said, “You can come back after one hour and then we will edit what you have written.” I was surprised at what seemed an unnecessary delay; over the last fortnight, I had at times worked for hours in his room itself, where I would write and he would edit, and, in parallel, he would write and I would edit. Now, when we had reached the last lap of the marathon, I wondered: why this delay? I was speechless. In the beautiful temple at Mumbai that Radhanath Swami has inspired, there is an inconspicuous deity of Hanuman near the one of the doors. Most visitors to the temple probably don’t even notice his presence. When we were discussing about Hanuman for the book, I didn’t even think about the deity. But Radhanath Swami, with his intense devotional alertness, not only remembered Hanumanji as the deity, but also delayed his work just so that he could seek the blessings of Hanumanji. The contrast between his devotional consciousness and my intellectual consciousness simultaneously dismayed and delighted me. Dismayed because I was seeing the writing mostly as a literary activity, which I would excel at by use of my literary skills. Delighted because I was seeking the example of a person whose writing skills were far better than mine, but who was humbly offering prayers and seeking blessings to be able to write, not a whole book, but a few paragraphs within a book. Generally, during my writing, I pray only when my literary skills fail me and I am forced to realize that, without higher help, I am stuck. But Radhanath Swami was teaching me by his example of how prayer should precede action, not succeed action. I remembered how before Radhanath Swami had written his first book The Journey Home¸ he had been asked, “Are you a writer?” He had humbly replied, “I am not a writer, but a prayer-er, one who offers prayers.” Of course, he is not just a prayer-er; he is a writer, an excellent writer at that. And his excellence in writing comes from his scrupulousness in praying. His writing, being divinely blessed, doesn’t just titillate the mind and impress the intellect, but touches and transforms the heart. From the depth of the devotion of his heart gushes forth the spring of his writing, a spring that cleanses and purifies all those who chose to bath in it. I hope to be blessed with many, many more opportunities to bathe in that sacred stream. Thank you for sharing that prayer should precede action, not succeed action. Who else but a pure devotee can remember and pray for mercy from the Lord and His devotees always under all circumstances? 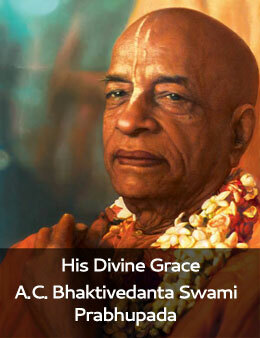 Radhanath Swami’s love for God and His devotees can be seen from this incedent. Thank you very much Prabhu for sharing such inspiring anecdote from the life of Srila Radhanath Swami Maharaj! Very very heart touching…. Radhanath swami is not telling to people how to follow the spiritual way but he himself follows the rules of bhakti. An example of how a pure devotee like Radhanath Swami Maharaj is completely dependent on the blessings of his superiors & is teaching by his example to all of us as to how we should always depend on the blessings & mercy of our superiors! Thank you very much HG Chaitnya Charan Prabhu for sharing this pastime of Radhanath Swami Maharaj ! Thank you very much HG Caitanya Charan Pr for sharing this beautiful story which teaches us an invaluable lesson – prayer should precede and not succeed action, however expert and skilled we may be at it! Maharaj is amazing.. it acts on the values which we rarely even think … All Glories to Maharaj ! All Glories to Shrila Prabhupad !! Radhanath Maharajs every act is so exemplifying .Thank you Maharaj ! Hare Krsna ! Thanks a lot for sharing this experience and inspiring me to understand the power of prayers.